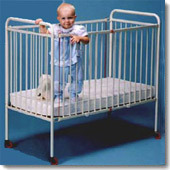 When it comes to commercial baby cribs, Wehsco wrote the book on safety. Whesco cribs are prized by day care centers, hoteliers and Mom and Dad for their portability, collapsibility and patented design. If you want state-of-the-art – you want Wehsco.